Description: Inspired by Tiffany's famous Harvard design, The Cambridge Mission is handsome and versatile. 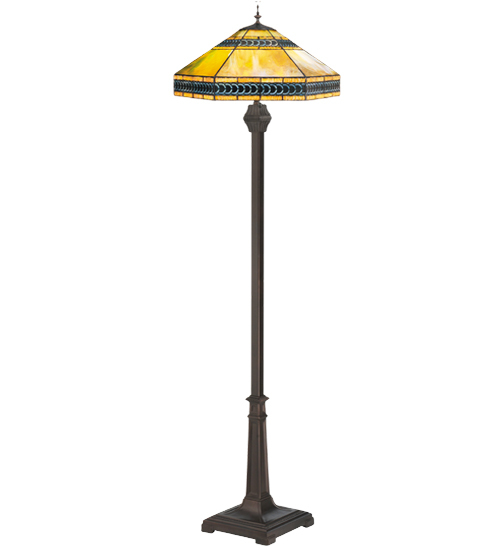 The shade is bordered in a crescent filigree over Sky Blue with Amber rippled glass accents, and like a fire opal, vibrates with swirled jewel tones of Jade, Amber and touches of Ruby and Cobalt that are unique in every panel, and every light source. The floor lamp is hand finished in Mahogany Bronze.